Microsoft has advertised Windows 10 S as faster than regular Windows 10, but the reality is that it just needs less maintenance. Windows 10 S made its debut alongside the Surface Laptop on May 2nd. Designed to compete against Google's Chrome OS for the education market, the OS was pitched as a more fast, secure, and stable version of Windows 10 by only allowing installation of Windows Store apps. After all, Chromebook sales were one of the few bright spots in the market in the past year, so Microsoft has good reason to be worried. Is Windows 10 S really faster than Windows 10 vanilla, however? Zac Bowden of Windows Central expanded on the hows and whys of this question today. The short answer is no. Windows 10 S doesn't have better performance than Windows 10 out of the box. Fast-forward to a year post-installation, though, and the story might be a bit different. Why? As most of us know, without proper maintenance, Windows slows down over time as downloaded programs fill our startup queue, registry, and services. Windows 10 S sidesteps this issue because Windows Store apps cannot add themselves to the startup folder and so cannot begin automatically eating up your resources upon login. Thus, a year after installation, Windows 10 S should start-up just as quickly as the day it was installed. You can achieve the same thing with Windows 10 vanilla, but you can't be installing programs without maintenance. 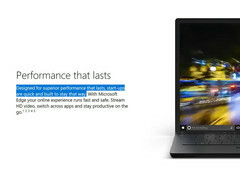 There you have it: if you're reading this, chances are you are smart enough to manage your own installed software without installing a bunch of toolbars, game launchers, or worse (GeForce Experience), and you will have no need for Windows 10 S.
> Notebook / Laptop Reviews and News > News > News Archive > Newsarchive 2017 06 > Is Windows 10 S really faster?